Martie Kruger, Chair of the Board for Westman Immigrant Services, and Dr. Heather Duncan, Associate Vice-President (Research) of Brandon University, have announced a two-year, community-university research partnership agreement. 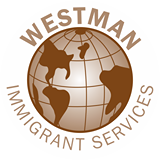 The agreement will combine the research expertise of the University with the front-line services of Westman Immigrant Services. Dr. Karen Rempel, Director of the Centre for Aboriginal and Rural Education Studies at BU, is the facilitator of the project. The partnership is based on a ‘Researcher-in-Residence’ program that is aimed at developing in-house research capacity to consistently collect and analyze information about programs and services.